This beautifully updated unit is across from Kalepolepo Beach Park (Sugar Beach) on the sunny South Shore of Maui! Beautifully Remodeled 4-Bedroom In One Of Maui's Most Coveted Locations - New Owners completed the remodel in September 2016! 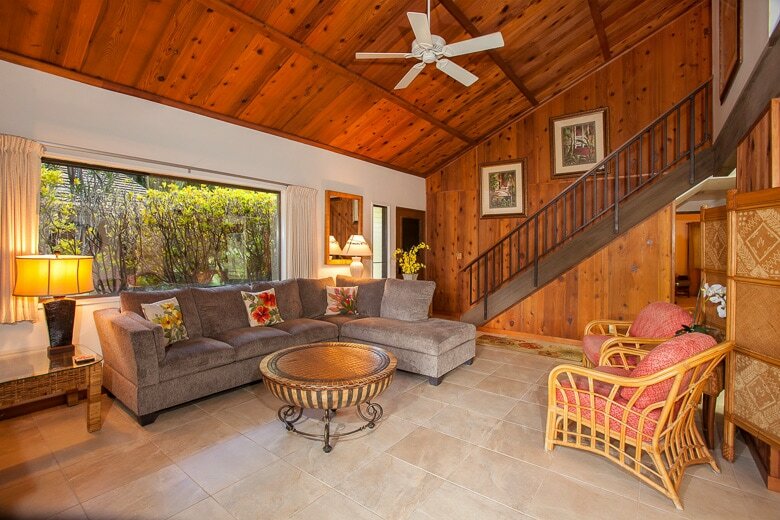 This 4-bedroom, 3-bath ground-floor, FULLY REMODELED end unit is tropically decorated in island style and is now available for your Maui vacation! The condo is located is conveniently located just 40 feet from the entrance to the swimming pool and hot tub. This beautiful 1900 square feet townhome has all new tile floors throughout. The spacious new kitchen is fully stocked, has beautiful new stainless steel appliances, microwave, full stove, oven and many small appliances, including a George Foreman countertop grill. Each downstairs bedroom has a California-King bed and there are two twins in the loft bedroom upstairs and a King in the upstairs "Aqua" bedroom. A new queen-size sofa sleeper in the living room provides additional sleeping accommodations for up to 2 guests. For bathrooms, there is a new walk-in shower in the upstairs bathroom and another one in the master bedroom. The downstairs hall bathroom has a full tub/shower combo. Each bedroom, and the main living area, has it's own privately controlled Air-Conditioning, making this unit very cool and comfortable. Relax on your own private ground floor lanai, which is located just steps from the swimming pool, hot tub and shuffleboard! This unit is one of the shadier units in the complex, making it a treat to sit outdoors and enjoy the Maui weather. The beautiful Koa Resort complex is located on over 5 tropical acres and consists of only five two-story buildings. There are plenty of activities for families to enjoy, including 2 tennis courts, the cabana with free WIFI, a jacuzzi, Shuffleboard on the deck, and a large heated swimming pool and hot tub (pool is heated during Winter months). Traveling with a large group? Be sure to ask about our other units at Koa Resort. We can accommodate large groups at this property (24 in this building alone), which makes Koa Resort great for families and reunions. Getting anywhere and everywhere simple from koa resort since there is a Pi'ilani Highway access road right next to the property (Kulanihakoi street). Kahului is just 8 miles from this property and you just have 25 miles to drive to get to Lahaina/Ka'anapali. Kalepolepo Beach Park - Across the street! Beautiful 4-bedroom DELUXE townhome at South Maui's exclusive Koa Resort. Largest condo pool in South Maui and FREE WIFI! Maui Kama'aina Real Estate Inc.